May 10th is Mother’s Day in Mexico, and what better time to recognize the female jaguars and cubs found on the Northern Jaguar Reserve. We are celebrating conservation efforts south of the border where the Northern Jaguar Project protects a breeding jaguar population. Silent auction of jaguar artwork and handicrafts. Music for the full moon by Tradiciones Taller. Preview of larger-than-life jaguar photos to be projected onto the U.S.-Mexico border wall as part of Un-Fragmenting: An evening of wildlife illuminations. Tastings of traditional regional fare and bebidas. Door prizes of heritage trees from Mission Garden. We have assembled a beautiful collection of jaguar art and handicrafts that we are excited to share with you: masks, carvings, paintings, pottery, textiles, and works featured from throughout the jaguar’s range. We hope you will be inspired to bid and show your support for jaguar conservation in Sonora. 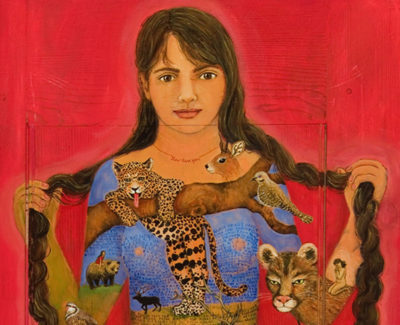 We look forward to seeing you as we celebrate the female jaguars of the borderlands.